DJzone DJ Magazine :: The American Disc Jockey Awards Can They Survive? The American Disc Jockey Awards Can They Survive? Back in February Ken Knotts held what some said was his swan song DJ awards show during the Mobile Beat get together in Las Vegas, but Ken says it isn't over yet! "I will never do another awards show while Mike Buonaccorso (Mobile Beat Producer) does his Allstars Show." The Allstars show, a talent show, was the card played by Mobile Beat when talks broke down many years ago in regards to support of the awards show. 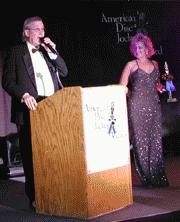 It is a "Gong Show" spoof of the prestigious American Disc Jockey Awards complete with awards for the dances and games. In a recent interview, Ken explained about the problems this years show had and how the time and resource restraints placed on his show for production and setup give the DJs in attendance the feeling it was amateur night. In reality, shows like the American Disc Jockey Awards normally take months to plan out and rehearse. Ken's show had one day to go from interviewing contestants and viewing their audition while workers construct the stage and backdrops, to a complete live show. "This is the Grammys for DJing, something most of these DJs will never see or be a part of in their lifetime." Ken continues. This years show was plagued with technical problems and due to what seemed to be extreme political pressure, Ken was forced to stray from the path the Awards show had taken in the past and go down the bumpy road of trying to please all the affiliations involved with the show, when in the past he stayed focused on making it "his" show. We all know that when a man has a dream, it shows in his work, and makes for a much smoother production. Over the years the show has had some truly professional productions. Those times had common threads running through them, major sponsors providing the manpower and the sound systems. Gemini Sound Products shipped in a truckload of sound and Bernie Howard whiled away the better part of a day to "tweak" things. Another time, and probably the best production the awards show had seen, was when Peavey brought it's touring sound system in with a complimentary crew and sound engineer to set it up. People just do not understand the pressure of having to handle all aspects of a production like this until they walk in Ken's shoes. Having professionals to handle the sound side of things made it one less item Ken had to worry about. Unfortunately, this year he was not given that luxury. Will we ever see another American Disc Jockey Awards show? I believe we will. It is pretty hard to stop a man with a dream. This years show was a mere bump in the road in the shows history, which since the beginning has grown tenfold in both class and production from the original "Let's meet at the Maxim bar and give out some awards". Ken told us that with the right support from a magazine and a few industry partners, he will do another show.